There were many more horses which I hope to show you sometime soon. 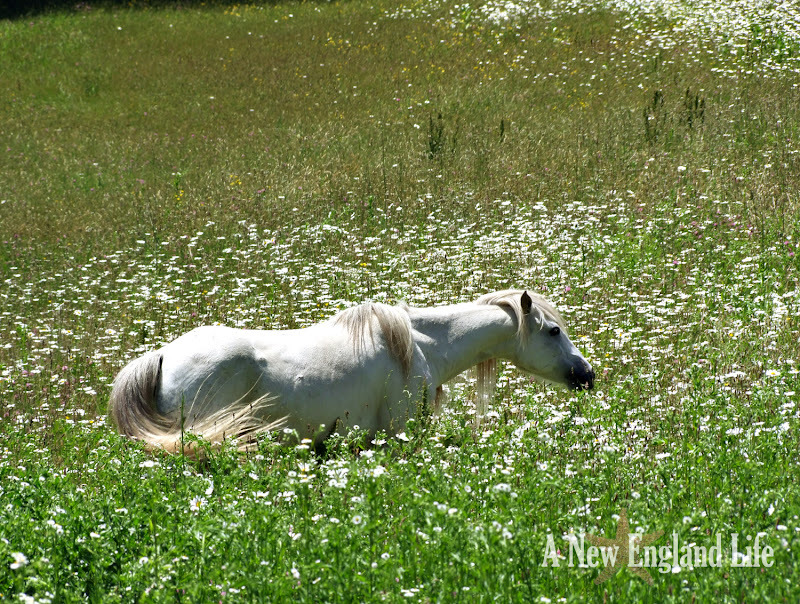 I just thought this young white horse looked beautiful amongst the flowers. It was a warm, muggy day here today. This afternoon we even had a tornado watch but it has been lifted. It seems to me a vanilla ice cream cone is in order! I don't know why, it just is. 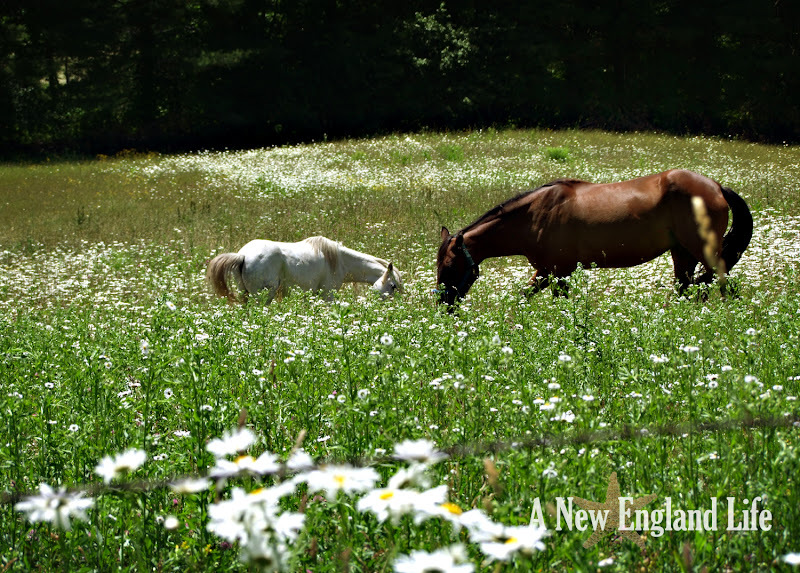 Although horses aren't my usual New England subject, they are a beautiful subject and I hope you enjoyed them. When I see this group of photos it makes me think of the old Michael Martin Murphy song, Wildfire. I'm also trying out a new watermark. Not sure if I'm diggin' it yet. On the final photo I forgot to make it a little more transparent. Although I like the starfish, the font has me pondering. And maybe the whole thing is just a bit too much. What do you think? Beautiful shots of the horses! And all those daisies - wow!! I do prefer the the more delicate font on your pics, but it is good to have a watermark. The white horse reminds of a unicorn. The daisies are plentiful! You do have beautiful photography. I think I like the watermark in the picture of the butterfly, it seems less obtrusive. The one in the post Wildfire seem to shout louder than the picture. Now, I'll be singing that song, Sharon! I must have that white horse picture! Sending you an email! 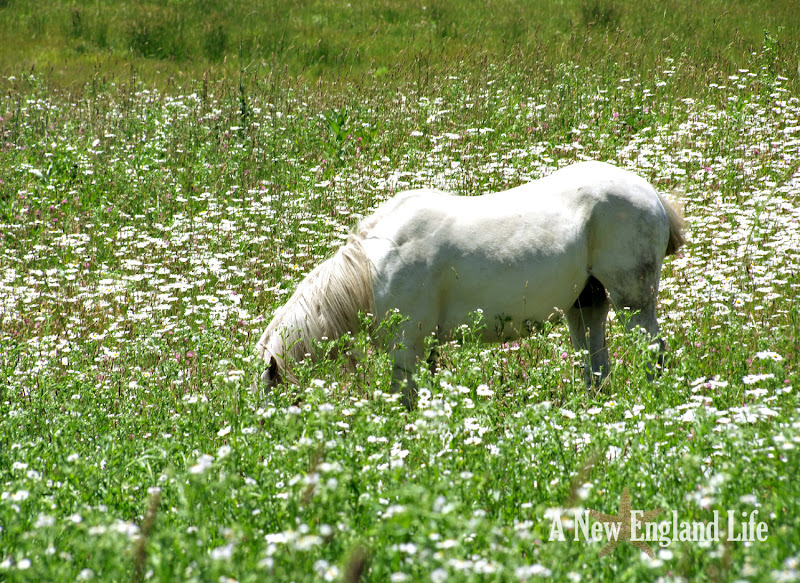 Spectacular photos of the horses amongst the daisies...loved them. Yep, now the song is playing in my head too! Hee hee.... White on white is great in any photo and the horses certainly look content. Hi Sharon.Loved the white horse in the daisies. He looked like one big white daisy! I like the watermarks to be almost transparent, Sharon, with smaller letters. Just an opinion. I guess I won't be using that watermark again! LOL! Curious Cat, I just liked the starfish because I love the beach. Beautiful Sharon - are these the horses that run across the road from field to field you told me about? Yes, I was relieved when the tornado watch was lifted. I had just planted all of my gardens, and they are new and fragile plants! Your photos of the horses in the fields are beautiful! I did a high school senior photo shoot this week, with a very similar scene. It was at a horse farm. Gorgeous flowered fields, horses in the background, sweet dusk light. I can't wait to see what I got, when I get to her in my editing. Just a FYI...I really had to look for the starfish in your logo..and finally saw it in the last full opacity one. Only because of the background, it is camaflouged some. Love the idea though! Those fields of daisies are absolutely beautiful, as are the horses. I hadn't thought about the Wildfire song in a while....so I took the time to listen, too. Horses have always been that childhood dream of mine! And I love that song Wildfire - I have burned onto my 70's mix CD - loL! Great photos! Beautiful photos of the horses. I prefer the original watermark. It is very pretty. Oh, who doesn't remember that song? Beautiful photos, Sharon. Wildfire, that was a great song from long ago. Those horses are gorgeous amid the flowers. I like the first watermark. That tornado watch was scary. The weather has been crazy lately! I love the horses in the daises! Love that song! Thanks for the earworm!